It has been my dream to have my byline on a newspaper. And it has finally come true. It has happened before but it was an overly emo essay that I’m not really proud of. 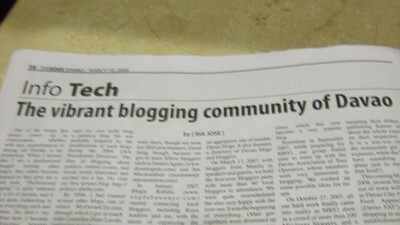 So anyway, I am happy that my article on the Davao Blogging Community. 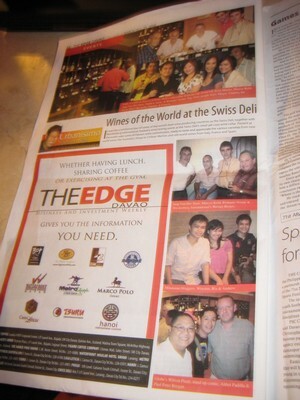 It’s on page 16 of the first ever issue of The Edge, a Weekly Davao Business and Investment Newspaper. 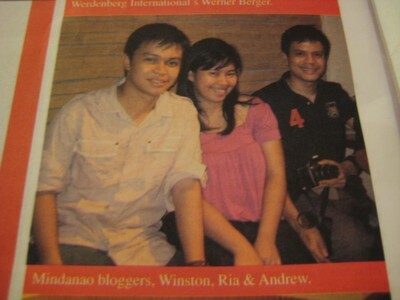 And on the second issue, me and my blogging posse (who are slackers) were included in the feature about the Wine Tasting at Swiss Deli. Thanks to The Edge IT Page Editor, Blogie Robillo. @Kelvin, WOW! I almost forgot about that “interview.” Do you know where I can buy Moneysense? Thanks for the link, Ria! Happy to have been of help in getting you published. Looking forward to more contributions from you.